Mmmkay, you all know Click, Clack, Moo: Cows That Type by Doreen Cronin. But what about all the other bemusing bovines hiding out on your library shelves? I want to share a couple of my favorite cow books with you. 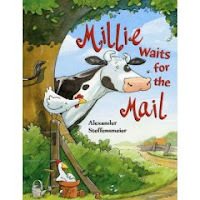 Millie Waits for the Mail by Alexander Steffensmeier is one that you won't want to miss. Every day Millie the cow waits for the mail... because she loves to terrify the mailman. She waits in hiding and then jumps out to scare him and chase him off the farm. All of the farmer's packages arrive broken. The mailman is suffering from PTSD. This has to stop! Both the farmer and the mailman come up with a plan... and it works... kind of. The hilarious illustrations and surprises in the story make this a great choice for storytime, but it would also be great for one-on-one reading because there's lots of see and talk about in the pictures. This one's a win ner all around and it's one of my new favorites. 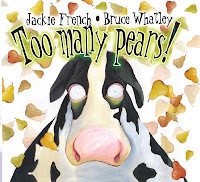 Too Many Pears by Valerie French is about Pamela, a cow who loooooves to eat pears. Nothing can keep her from getting to those pears and she eats so many that there are none left for the family! Luckily, someone comes up with an idea... Is it possible to eat too many pears? 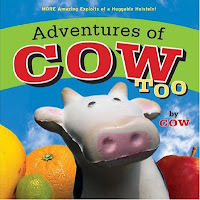 This is a silly story that would fit in perfectly for a cow-themed or a food-themed storytime. 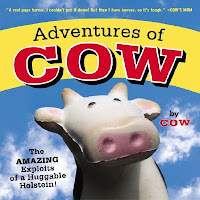 Of course, we can't forget Adventures of Cow and Adventures of Cow Too by Lori Korcheck. In both these incredibly silly books, Cow goes on an adventure and writes a book to tell his tale. The only problem is, well, he's getting everything wrong! Sharp-eyed preschoolers will love to correct each mistake. Although I've used them for storytimes, the small size of these books might make them a bit better for one-on-one reading. Plus, the silly mistakes Cow makes provide a great opportunity for talking about the things in the pictures. I'm fairly convinced that Karma Wilson can do no wrong. So, of course, I have to include Sakes Alive! A Cattle Drive. 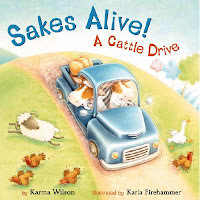 The whole book is a play on the expression "cattle drive" because in this book, the cattle are driving. And everyone else better get out of their way! Anything in the road is liable to go flying, but the townspeople are thrilled when the mad chase turns into a rollicking parade. A silly hit for your storytime. These are some of my favorite cow books... What are yours? My students and my nieces and nephews all love Millie Waits for the Mail, too. Of course, I enjoyed it as well. I love Mem Fox's A Particular Cow. It makes me laugh every time (what with the bloomers and all). Great list!